Costs of unused railway infrastructure: If the tunnel were to be built initially with railway infrastructure (tracks, power and communications) as Seattle Subway suggests, these would still require some form of maintenance even if they were not being used. These infrastructure components don’t stand still over time, and will have an aging effect. No one really knows how long it would take for rail services to begin, but it would be a waste to maintain infrastructure that is not being used. There are only 3 stations (Westlake, Madison and International District), fewer than the current DSTT. Although this would give a direct connection to Madison BRT, it would also mean that buses serving the new tunnel have farther stop spacing and potentially shorter travel times than light rail in the DSTT, the opposite of what it should be. Conversion to rail could be a slow process due to institutional and political inertia, which may result in another DSTT situation where buses are “phased out”. The lesson to be learned from the DSTT, is that joint-operations is difficult and results in unreliable service for every mode, even six years into operations. In an attempt to explore how these issues could be resolved, I’ve created another proposal, which is a tunnel on 4th Ave that will accommodate all light rail services from the beginning and in the future. The current DSTT will then serve buses (again) and potentially streetcars. The “Westlake curve” will also be removed, allowing higher speeds in the tunnel. I’ve listed a few key advantages of this proposal. Removes infrastructure constraints from the network: The current DSTT has a few limitations on speed and acceleration. One is the horizontal shift in the rails before and after the platforms. The others are the tight curves just south of Westlake and International District.With a new tunnel, Sound Transit can take advantage of the (rare) opportunity to remove those limitations by designing a large-radius curve between University St and Capitol Hill, while using better transitions before/after the stations. This will allow for higher travel speeds through Downtown Seattle. This also removes one of the infrastructure constraints that prevents Sound Transit from purchasing higher-capacity non-articulated vehicles, such as those on standard subway systems. 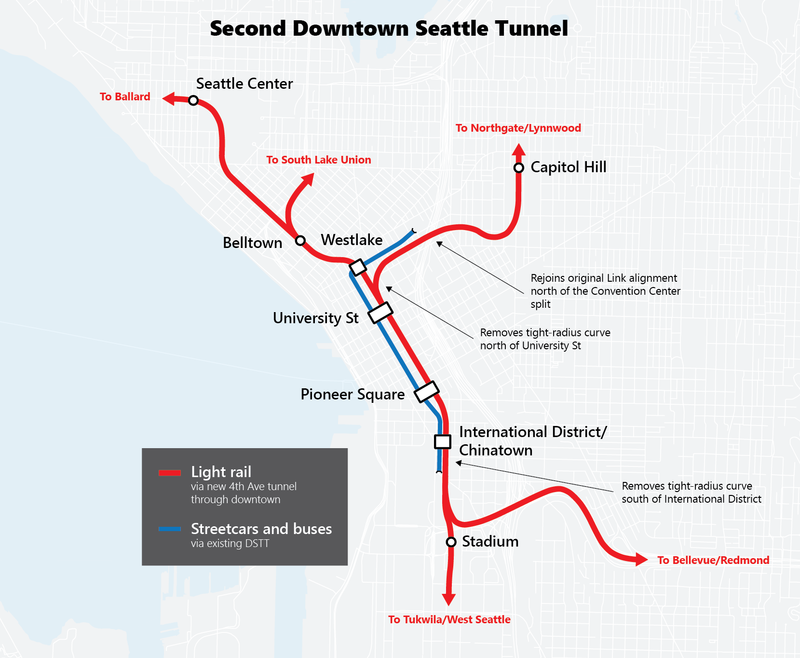 More leverage for regional funding: The prospects of regional funding for a tunnel that will, at its beginning, only serve Seattle routes will be a tough sell. However, if it can be used by regional rail in the beginning (Central Link and East Link), and provide travel time/frequency improvements on opening day, there could be more leverage to ask for funding. Separation of operations from day one: Dedicating the new tunnel to rail on opening day will prevent a repeat of DSTT. Joint-operations doesn’t work for a variety of reasons, but the basic concept is that rail operations are completely different from bus operations. Rail involves one large vehicle regulated by signals, occupying a section of the track at a time as it travels through the tunnel. Bus operations involve several vehicles, arriving and departing at various times. This has the potential to occupy multiple sections of track simultaneously, delaying service behind it. Providing a separation from day one will avoid this situation. DSTT can serve both buses and streetcars: DSTT rail infrastructure could be converted to serve streetcars. Joint operations for streetcars and buses would be more compatible than light rail and buses, as their operation philosophy is mostly similar (short vehicles that can operate in mixed traffic without dedicated signalling systems).Some modifications will have to be made. This includes extending the width of the platforms by about 3 inches to accommodate the narrower streetcars, but the floor height is roughly the same (355 mm for Link and 350 for Seattle’s streetcars). Streetcars will also have to be capable of running at 1500 V DC in the tunnel and 750 V DC on the surface, although dual-mode operations are not uncommon elsewhere in the world. 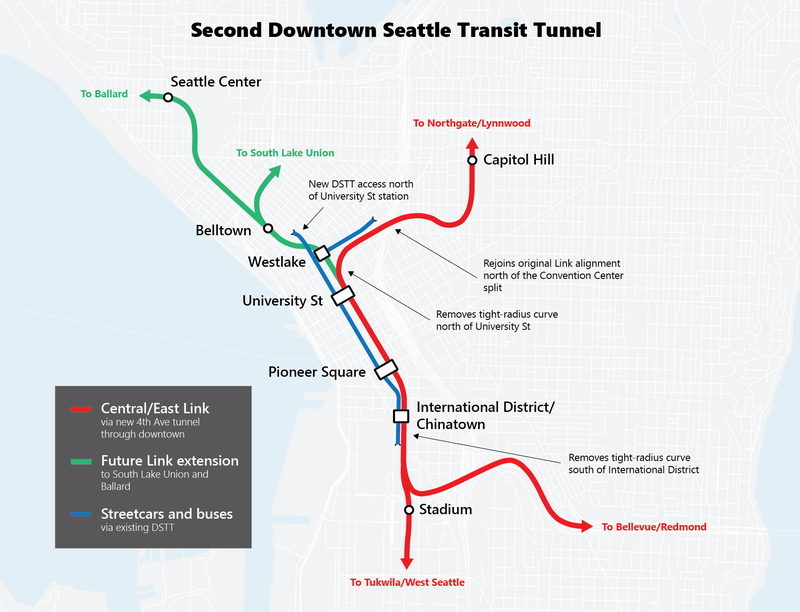 The most obvious drawback is that Central Link and East Link will skip Westlake Station, which is necessary to provide the large-radius curve between University and Capitol Hill. The good news is that the DSTT will still serve Westlake, and a future light rail extension to Ballard could reintroduce light rail service beneath the current Westlake platforms. Skipping the station also improves travel times for the regional-oriented Central and East Link lines. Service disruptions when transitioning to the new tunnel. Bus and streetcar services in the DSTT depends on the fate of the Convention Place Station, and whether access to the DSTT will be preserved after its expansion. If not, a new access point will have to be built. This alternative is certainly not a fix-all solution, but addresses a few issues where Seattle Subway’s proposal may fall short.